In a joint statement this week, Prague-based seed accelerator StartupYard announced it will move to Node5, the open tech workspace. As part of the partnership, the two companies will develop over the coming year a series of hands-on events and workshops accessible outside the 3 month acceleration program, to entrepreneurs who are not able to join the StartupYard accelerator. 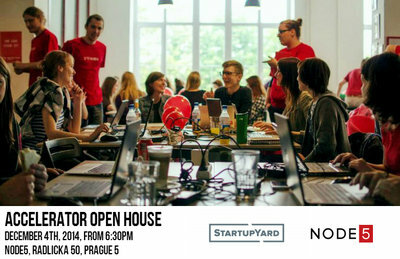 To kick off the partnership, StartupYard Managing Director Cedric Maloux and Node5 co-founder Lukas Hudecek will host an “Accelerator Open House,” where local entrepreneurs, programmers, investors and StartupYard mentors will meet to discuss life in and after a tech accelerator. Hudecek reflected that the move to Node5 was “a kind of homecoming,” as he was among the original co-founders of both the accelerator, and the workspace. The event scheduled for Dec 4th, 2014 will feature keynote remarks from Microsoft Europe Chairman and popular StartupYard mentor Jan Muehlfeit, who himself recently announced his departure from Microsoft to focus on mentorship in the region’s tech community. "After stepping down as European Chairman at Microsoft, following a very fruitful 21 years with the company, it's a great pleasure to give back to the tech community in Prague and Central Europe, focusing on helping individuals, organizations and whole countries to unlock their human potential,” said Muehlfeit regarding his work with StartupYard. "Being a mentor at StartupYard has presented me with a great opportunity to assess the potential of young entrepreneurs in the region, and to have a positive impact on their growth, so I'm looking forward with anticipation to the next evolution in our efforts as a community, in cooperation with Node5." This public event will take place at Node5, Radlicka 50, Prague 5, beginning at 18:30, December 4th, 2014. StartupYard is a seed accelerator for technology startups. Its goal is to help companies build viable products, launch fast and successfully raise capital. It follows the philosophy, methodology, and standard of world-class accelerators such as Y Combinator or TechStars. StartupYard’s efforts were awarded by membership in the Global Accelerator Network in June 2012, and it is a member of StartupYard Accelerator Consortium CeedTech. Since September 2011 StartupYard has accelerated 29 companies, out of which 4 were acquired, 19 are still active, and 10 have raised investments for a total of $2.5 Million. For more information, read our blog, visit our website and follow @startupyard on Twitter. StartupYard, a tech startups accelerator based in Prague, and focused on Data, Mobile, and Analytics projects from across Europe, recently announced a call for applications to its next accelerator round, backed by a combination of private and European Commission funds. This effectively triples funds available to new applicants to StartupYard over previous rounds. GoodData, the leader in cloud business intelligence, and StartupYard, a mentor-driven seed accelerator based in Prague, today announced a partnership to provide select startups with free access to the GoodData platform. StartupYard is recruiting applicants for its fourth round until January 31st with the theme of Data, Search and Analytics.